I have gone and done it. What? You may ask. I fell in love with an actress, yes, a woman. 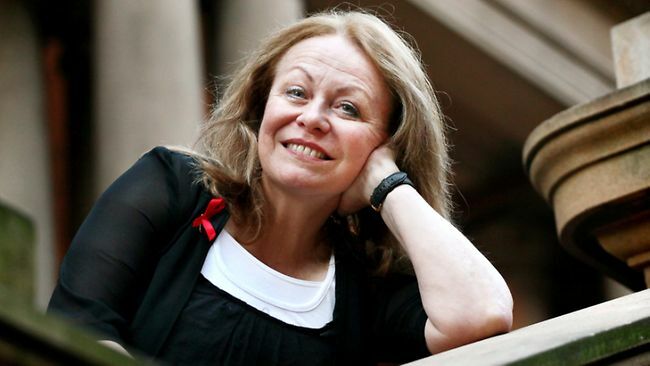 Her name is Jacki Weaver. She is an Australian actress whom I remember had a role in the film Stork (I know, it was made in 1971, the year I was born, but it aired every year for many years on end and I remember her energy, vitality and lovely eyes back then). I did not know much about Jacki Weaver, excepting the TV appearances that always seemed to shine in. That was until I watched Australian Story (ABC) the other day. It was a documentary on her. Sometimes Australian Story features ordinary Aussies doing amazing things, rising up through the toughest times of all... amazing courageous people. This time it was no different really. Jacki has an amazing presence to her. With one expression of excitement she can make you smile and feel great... in the next instant she can look worried, in turmoil, about to cry and you too feel that way. Her face is so full of expression you know. But, what got me, was when the story touched on her love life. She still is in love with every single man she has been with. I find that amazing. So many people carry the burden of disliking their ex partners but not Jacki. She just cannot hate anyone it seems. Also, to still love someone she nursed until they passed away, her life time love Richard Wherrett. Who himself was an enigmatic person. To quote Jacki from her Australian Story piece " I think all love relationships, you have to share the same sense of...laughter -laugh at the same things". She is not wrong. What else is beautiful is that she was and still is, in love with Richard Wherrett with the full knowledge that he was homosexual. She states " knew Richard was homosexual from the very beginning, but it didn't affect my falling in love with him. It didn't affect any aspect of our relationship." And that is how love ought to be. Jacki also reported that she got out every book she could and educated herself on homosexuality and they (her and Richard) would discuss it openly. He said to her " Don't you see that there's something about you, too, that's needy that you fall in love with a man who is homosexual?" Well, I agree with that too. Yes, Jacki is a lovely, radiating personality, and she is so like me in that she cannot hate any person. And that she would stay in love forever with the people she had fallen in love with throughout her life. I think it is important to keep a rapport going with those who have helped you throughout your life, just as she has. She is a pretty special person for most Australians, I suspect. What a nice tribute, Cazzie. Your blog has always been filled with love and tolerance so I can see where you would relate to her. I have not watched the Oscars for years, but I will tomorrow night and be destroyed if she does not WIN her category. Helena Bonham-Carter does not deserve it more as she did NOT have to stretch to play Elizabeth Bowes-Lyon, she is after all, from exactly the same level of society. Miz Jacki deserved an Oscar for Caddie 30 years ago. I do hope she at least scores a heap of gorgeous things from those goody-bag parties the nominees are invited to (see Daily Mail online for the details).